It’s 10 am at the Corbin, KY Wal-Mart. As we wait in the vestibule amidst the flashing lights of the pinball machine and slow drawl of the greeter’s “welcome to Wal-Mart”, I spot them…Buddha Power Beads, promising strength and happiness to all who wear them. Buddha Power Beads have suddenly become mandatory race equipment. Two quarters and a crank of the knob on the gumball machine and they’re ours! Siddhartha Gautama must have known about Adventure Racing. The race began for us on Wednesday evening. As we arrived at Cindy’s house, she was in the middle of an epic phone call with REI in Nashville, trying to find out why the headlamp she had ordered several days ago had not arrived. After much threatening, REI agreed to ship the headlamp to our hotel in Kentucky and we were off to load the car. 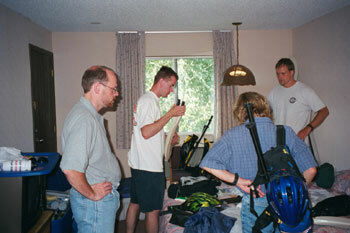 Amazingly enough, we were able to load everything in the car, strap the bikes to the back of the van, and roll. After a long drive through much of the night and a very brief stay at the Day’s Inn-Louisville, we arrived at the race headquarters. Our plan: Check in, get to the hotel, unload, eat, and sleep. All is well so far. No suffering…yet. At the pre-race meeting, we learned our fate. We would start at 4 am with a bushwhack/swim section through Laurel Lake. We would then pick up the bikes for a 45 mile ride through dirt and paved roads along with what would prove to be a tough singletrack section. On to the inflatable kayaks for an 8 1/2 mile paddle down the Cumberland River and then, for the first time, we would see our support crew. Next up would be a monster trekking section mixed with several rope segments. Expected trekking time: 13 hours minimum. Another 50 miles of biking would lead us to the boats for a final 10 mile push to the finish. All existence is full of suffering. The swim/bushwhack section was exciting. Cindy had the idea before the race to bring swim fins and it paid off huge! 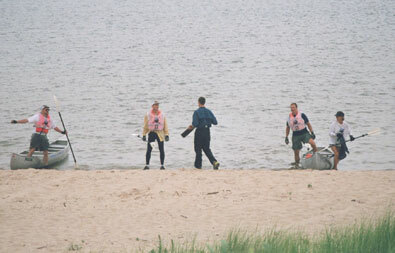 We were able to jump in the water, float on our backs holding our packs, and motor along. It was cruel fun to create a wake while passing struggling competitors. We choose to do a little bit of bushwhacking after the first swim instead of just jumping back into the water and that cost us some time. Despite that error, we still improved our position steadily through this section of the race moving from 28th at the first checkpoint to 22nd at the bike pick up. The bike ride began innocently enough with 8 miles of roads. We’re thinking to ourselves, this is easy! Once we hit the singletrack, things changed. The scenery along the Sheltowee Trail was great, passing by towering 200 foot rock faces and walking beneath small waterfalls. But tough was not the most appropriate word for this stretch of trail. The trail was littered with downed trees and sharp rock gardens turning a good ride into an agonizing 10 mile hike-a-bike. At one point, we were hiking with another team who asked when we were expecting to arrive at Checkpoint 4. I stopped and stared. “Checkpoint 4″? I asked. “We passed it about an hour ago. The look of fear on their faces as they realized the mistake is unforgettable. More suffering, but this time it’s not us. We were thankful to finally reach the road after five hours of singletrack hiking. The first hill on the road was long and brutally hot. I thought we were going to touch the sun. Once on the road, we had only two hours to go 27 miles to reach the boats by the cutoff time. Smart decision making and map reading helped us as we made it with not a second to spare. Sitting in 22nd place, we were the last team to officially get in the boats. We thought that getting to the boats was our saving grace. Suffering arises from the constant effort to find comfort and stability in an uncertain world. I truly believe that “Sevylor” stands for “Yellow Boat from Hell”. Ray and I took one boat and Cindy and Randy the other. Ray and I couldn’t get the boat to go in a straight line to save our lives. We tried everything…Short strokes, long strokes, synchronized paddling, un-synchronized paddling, switching positions, sitting on the floor, sitting on our knees, using the rear paddle as a rudder and allowing the front person to paddle, towing. We even took the paddles apart and tried to use them like a canoe paddle. Nothing worked! If we hadn’t dumped our fins with the bikes, we’d have gotten out and swam. We were able to get about three paddles strokes and the boat would turn. We tried correcting strokes and they made it worse. We tried to correct from the front using a sweep, from the rear using a j-stroke, back paddling. Again, no luck. Instead, we turned in circles for four painful hours. We got to the boat landing at 11 pm and finally sat down with the crew. pressure from the race organizers to make a decision. In our minds at that time, we felt the best decision was to stop. Suffering can be relieved. Many factors led to this decision, which I still struggle with for many reasons. However, the mental aspect of the upcoming challenge, the physical aspect, the frustration of being in the boat, etc. all built up to our decision to stop. chose to stop based on everything I saw at that point. Looking back, I feel that I let the team down by giving them the answer they wanted to hear at that point in time, but not the answer that they needed to hear and would be happiest with in the long run. Even though we had no chance of finishing the complete event based on the remaining time, I would much rather have stopped due to the race organizers sweeping us off instead of our choice. As it turns out, only two out of the thirty-five starting teams actually finished the race as ranked teams and the entire second paddling section was eliminated for that to happen. The fastest team through the trekking section, originally expected to be 23 hours, took 18 hours. Congratulations to Team Mid-America Xtreme/Rajalta Rajalle and Team Celebrex on your performance! Kip Richards and the Pathfinder Crew, great job setting a tough course. Thanks for your work! Despite our setbacks, we had a great time as a team. We laughed a lot and we’re stronger for our next event. Adventure Racing is about learning. It’s learning about yourself, your abilities, both mental and physical. Your personal limits and those of the others around you. I’ve learned much from this race. “Right” thought. Open your mind to the big picture. Don’t consider what’s happening now. Instead, think about your goal. Actions. Your decisions affect more than yourself. Be aware of the consequence of your actions. Understanding. Listen to your team and put yourself in their shoes. Not everyone feels the same at all times and you need to be there to support them during the good and bad times. Speech. Make sure everyone’s voice is heard. Livelihood. 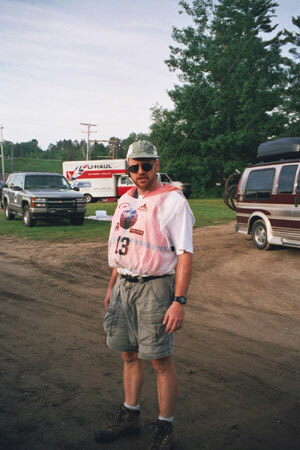 Don’t make Adventure Racing work. It’s fun. Enjoy yourself above all. Concentration. Stay in the game. Everyone else is having trouble too. The Buddha Power Beads are tucked away safely and will make their return at the next race! The buses rolled out of the Wildman Whitewater Ranch at 4:45am. 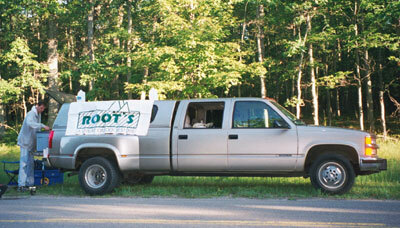 Clear skies, and northwoods summer temperatures greeted us as we drove to the race start. 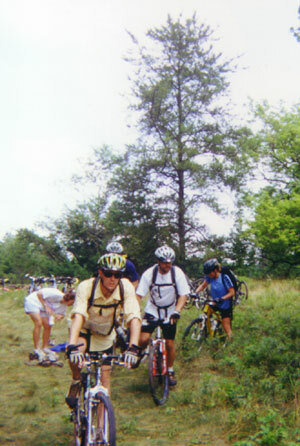 Forty teams started the 2000 Mid-America Extreme Adventure Race, amid hoots, cheers and howling hunting dogs (for real). 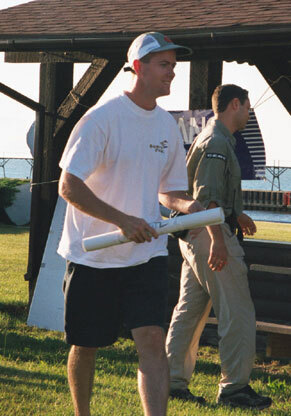 The race began with a 1.7 mile run to the start of the orienteering section. 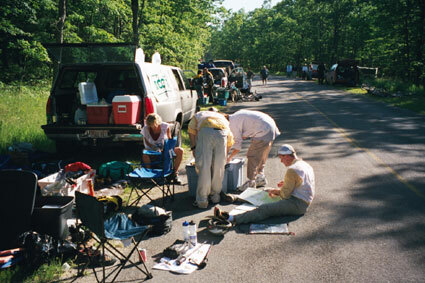 Different from most races, the orienteering section consisted of a 10 mike trek through 7 unmanned orienteering checkpoints. We navigated to each point, punching our passports with a special stamp signifying our arrival at each site. Team Orange Triangle, relying on John McInnes’ solid map and terrain reading skills, moved swiftly through this section with little trouble. Finding the locations did not prove too difficult, getting to each location was another story. Points ranged from deep in the woods, close to the road, high on Baker Rock, to the middle of a swamp. The cedar swamp trek for two hours slowed us down a bit and almost caused Tracy to lose a shoe, but we held on. Following the swamp crossing, we found ourselves at the rappel site in 13th place. Five hours into the event, we were ready to change the activity. A brief 40 foot rappel was just what we needed. Another hour and several water and mud crossings brought us to the first transition area. New socks, water, food, and bike shoes, and we were off again, this time in 12th place. The bike leg was to be difficult and we weren’t disappointed. We began with a quick 2 mile warm-up, followed by one of the race highlights, the bikewack. As if orienteering through the swamp without a bike wasn’t enough, the race organizers thought we might like to try them both together. It was only a ¼ mile section, but the occasional waist deep mud bog made it seem more intense. The bike leg consisted of a combination of 26 miles of two track roads, snowmobile trails, and gravel roads. The rugged snowmobile trails, littered with television-sized boulders, made for slow movement on the flats and uphills and great excitement and airtime on the downhills. This section brought many teams to a stop. Ever confident we kept chugging along, remaining steady in our standings. The heat took its toll and 2 teams got past us bringing us into the second transition area in 14th place at 3:15pm. The entire day was free of rain with exception of the 10 minutes we spent in this transition at McCaslin Mountain. We dropped the bikes, switched gear, and shoes, grabbed the climbing gear and headed off at 3:25pm. Facing our team was a three hour uphill hike over and back down McCaslin Mountain, two more checkpoints, an ascent up fixed ropes, and whitewater rafting on the Peshtigo River. One hour after leaving the transition area, as we neared the top of McCaslin Mountain, the race organizers showed up on an ATV…we have a problem! The local 4WD club has decided to join us in the woods and has moved all our course makers, we’ve been hiking the wrong trail for nearly and hour…uphill. They are re-routing the course and we’re going to skip the ascent (and we bought those ascenders just for this race too)! 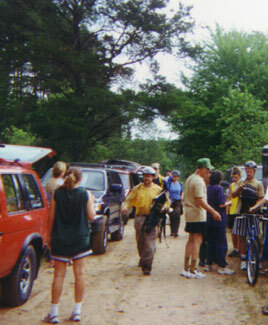 Back to the transition area and a 4 mile hike down the road from there led us to the start of the whitewater section. Three hours after first leaving (and returning to) the second transition area, we arrived at the boats. We were pretty excited about this leg of the race, despite our all-around lack of experience on whitewater. The boats were inflatable “Thrill-Cats”. It’s a cross between a mini catamaran and a kayak. Very maneuverable and quite fun. with names like Widowmaker, Five Foot Falls, and Horserace was a ride we’ll not soon forget. We all came through the water section well, and completely soaked. Well worth the trip down the river! Team Orange Triangle completed the race in 8th place in the mixed team rankings, and 12th place overall out of 40 teams. Our finishing place continues to improve, our experience continues to grow, and we’re having a great time. 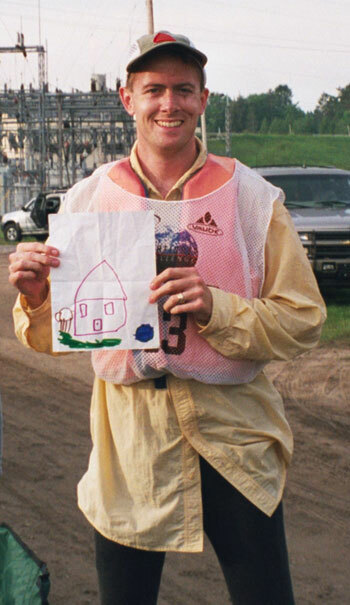 June 24, 2000, 8 PM – The pre-race meeting. 168 nervous people find out their fate for the next 48 hours. Each team gets a set of 11 maps. Next step…where do we go? 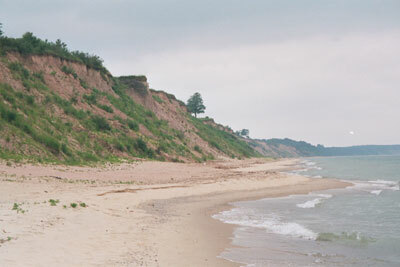 The race started at 5:15 AM with a 3-4 mile hike down the Lake Michigan shore. A perfect start to the race. At CP1, we pick up the bikes and head out for 25 miles of roads, dirt trails, goat paths, and sand pits. We entered the transition area, cheering and having a great time, at about 10:30AM. Checked our maps at the transition area, changed out of the bike shoes, more water, food, grab the horse and go. Eleven miles with Candy the horse, followed by 22 grueling miles of hiking (and don’t forget the 2 river crossings! ), brings us to the zip line. 550 feet of rope over water at a max height of about 150 feet. AMAZING RIDE! 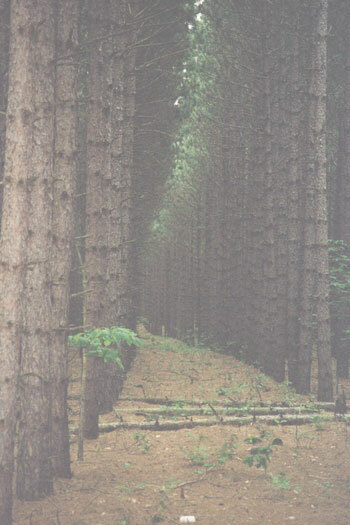 Next, we set off on 25 miles of possibly the best singletrack in the state of Michigan, maybe even the best in the Midwest! Rolling hills, exposed drop-offs, fast downhills, all between the hours of 1 AM and 6 AM to add a bit more excitement! 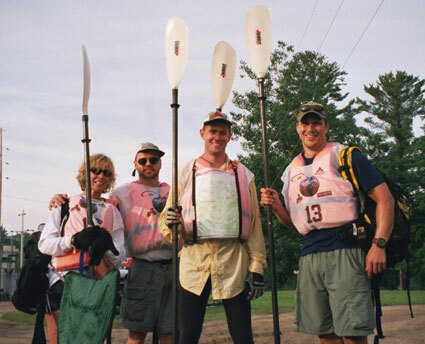 7:00 on June 25 – We pull into the last Checkpoint ready for a canoe ride…the 45 mile canoe ride with no end!!!! Wait a minute…how long are we going to be in that boat???? Did you say 45 miles!? Len and Lori pack up the Load Warrior and head back to the finish line to cheer us on. Thanks crew!! You’re awesome! A mere twelve hours later, we can’t get out of the boats fast enough! We’ve done it. 38 1/2 hours of pure excitement, and it was all worth it. Team Orange Triangle has completed the Pathfinder Challenge 2000!